One of the biggest challenges in trading is determining when prices will experience a reversal or just continue the trend. Although it cannot be said to be easy, this is important to know because it can be a reference in the use of various strategies, both in spot forex and binary options. Various indicators were created and complemented by a presentation of analysis of support and resistance levels, with the aim of helping traders to find out more precisely the pattern of price movements. Even so, it cannot be denied, although using indicators, subjectivity factors are often still influential in determining support or resistance levels. Fibonacci indicators for example, require the carefulness of traders to determine their own points of withdrawal of swing high lines and swing low or support and resistance lines. But don't worry, there are still more objective indicators, namely Pivot Points. This pivot point indicator is also suitable for trader binary options. Pivot points can be interpreted as price levels that reflect reversal points on the price action of an instrument. In this case, the pivot point calculation can produce support and resistance levels, where prices are expected to bounce when they reach these levels. If the price crosses certain pivot points, this can be interpreted as the beginning of forming a bullish or bearish sentiment. First, pivot points have an easy counting system. Second, points obtained from pivot point calculations are also very flexible to be placed on various instrument charts, such as forex, stocks, commodities, binary options, and other financial assets that can be traded. The third reason for using a pivot point is a fairly high level of accuracy. This is what makes pivot points popular with traders. The accuracy of the trading signals generated almost always meets the expectations of traders. 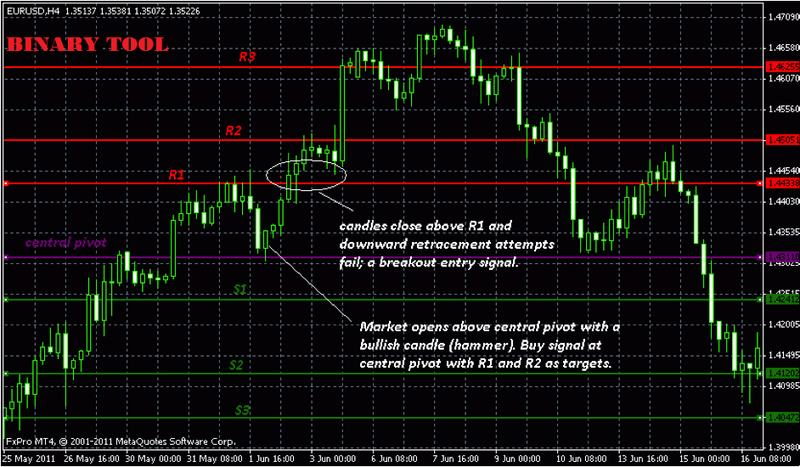 Fourth, the pivot point is the main indicator in the price action method. When compared with the MA (Moving Averages) indicator, the pivot point responds more quickly to the movement because traders only need to anticipate the price level whether to bounce or breakout the level of this indicator. While the MA is based on price formation in 5, 10, or 30 days so that its nature will be lagging or lagging in the ongoing market movements. Many ways can be done to calculate pivot points. The more advanced technology now allows traders to automatically calculate pivot points through a pivot point calculator. Traders also don't need to download a particular application to get the right calculation, because currently many forex sites provide online pivot point calculators. The highest, lowest and closing prices are obtained from the price level at the close of the previous period. This depends on the time frame used by traders. If a trader observes the daily chart, then the price is taken from the previous day. Likewise with the weekly time frame, the trader will take the price achievement from the previous week. When talking about binary options, the trader will be faced with two choices, namely "call" or "put" which predicts whether the price will move up or down, and then place the option on a more confident choice. In this case, the pivot point can determine the price movement sentiment. On the GBP / USD chart with the 30 minute time frame above, the price indicates a confirmed uptrend after breaking the S1 level. In this situation, opening a "call" position with an expiration time of 1 hour to 1 day can be done to harvest profits from the movement of the pair above. Meanwhile, levels of S2 / R2 and S3 / R3 can be used to observe price levels that will experience a pullback, or are at the saturation point. In the chart above, the price movement has pulled back after not being able to penetrate the S2 level, if the retracement is unable to touch that level, traders can place the option "put" to estimate the price reversal. Expiry time per hour to daily can be chosen to benefit from the condition of the movement of the USD / JPY pair above. In addition, it should be emphasized that the use of other indicators that confirm trading signals can help traders in placing options on binary options trading positions. 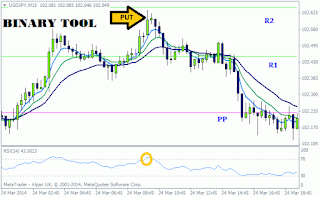 The USD / JPY chart above indicates a strong "put" trading signal because in addition to the analysis of pivot points, the RSI indicator shown below also indicates that the price level has reached overbought points. Pivot points can also be used to analyze the right entry option position, both when the market is ranging and when in trend conditions. 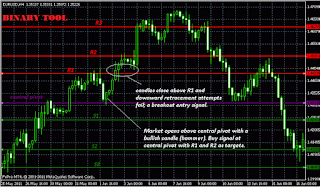 The main idea of ​​using a pivot point is to utilize the R1 or S1 level as the main indicator in determining the price movement trend. For traders who expect market conditions to be sideways, trading positions must be closed immediately when the price level will approach the closest levels of PP. 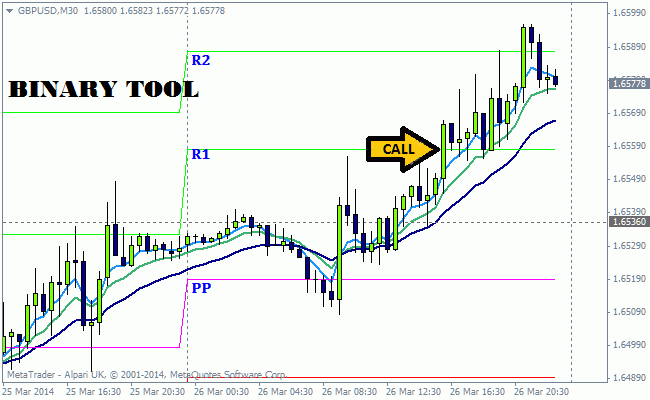 To place the "call" option, the trader can wait for the price to move above the PP, which will be more confirmed if the price continues to rise near the R1 level. At this stage, it would be safer if the trader locked the profit by closing the trading position when the price touched the R1 point, because conditions ranging from displaying a difficult price penetrate the support and resistance boundaries. Therefore, the trader must be able to estimate how long it will take for the price of an instrument to reach that point, in order to determine the exact time limit. Conversely, traders can choose the "put" option if the price moves down lower than PP. The estimated expiry time should also take into account the achievement of the price level towards S1, because in this area a new chart will show a definite trading signal when the price level breaks or precisely bounces from that point. Traders can expect a trend if the price level breaks the S1 or R1 level. It is important to note that the breakout in R1 will not necessarily indicate a strengthening uptrend, as well as a break in S1. What needs to be underlined here is the breakout of R1 or S1 levels will show a strong trend, but does not guarantee whether the direction of the trend will be consistent with the levels penetrated. Prices may have a very strong downtrend after breaking R1, or experiencing a reversal of an uptrend after the breakout of the S1 level. Therefore, traders need to pay attention to the characteristics of breakout formation which usually starts after the price moves in the same position for some time. One way that can be used to ensure the direction of trend formation is to pay attention to the price formation pattern at support and resistance levels. Before a bullish trend occurs, the price will test the resistance level for a while while showing retracement points that appear higher. This behavior indicates pressure to buy, which will soon show a pattern of strengthening uptrend significantly. To analyze bearish trends, traders can observe price movements testing the support level for some time, with retracement points being lower. Thus, the "put" signal for traders will be stronger because prices will soon breakout and show a strong downtrend. From the chart above, it can be seen that price movements tested the R1 level for a moment, before finally falling back and bouncing at the pivot point (PP). Actually, this alone is enough to confirm the "call" signal, because the price will rise again to touch the R1 level. After successfully penetrating R1, the price then tests the R2 level with retracement points that are unable to reach PP, so the breakout above is the biggest possibility that will occur in the movement of EUR / USD pair in the illustration above. 1. Open a position with the type of trading in / out, where the selected option is "out", to estimate the price level is beyond the range of S1-R1. Expiry time used is 1 week. 2. Using the rise / fall type of trading, with the EUR / USD forecast to "rise" above the R1 point, by applying the daily expiry time limit. 3. Open a position with the type of touch / no touch trading, where the option placed is "touch" on the price range between R1 and R2 levels, with an expiry time of one week. The ability of the pivot point to analyze price movements that will occur with support and resistance levels, is not without weakness at all. The determinant indicator resulting from the calculation of the closing price is one of the short-term indicators, the results of which will only be valid until the end of a trading session. To anticipate it, expiry time in trading positions should be adjusted to the time frame observed. This is because, price action will be more difficult to predict when starting to enter the next trading period. In addition, traders also need to anticipate how strongly prices react when prices break through certain levels. The existence of fakeout and breakout also needs special attention if the trader does not want the option to end out-of-the-money. Therefore, combining pivot points with several other technical indicators and observing candlestick patterns are strongly recommended in binary options trading. This will help traders filter fake trading signals and increase accuracy in binary options strategies with pivot points.